(1) The refrigeration compressor motor winding must not be overheated. This happens when the starting torque of a variable frequency drive dimensioned too small is not sufficient for starting the refrigeration compressor. The consequence of a stalled start is insufficient cooling of the refrigeration compressor motor. The winding temperature will then rise quickly and at 120 °C or above it is in danger (see the Figure on right). (2) A stalled starting attempt has to be detected immediately and the variable frequency drive inhibited before the winding temperature increases to a critical temperature. Restarting of the variable frequency drive must be prevented for a period of at least 1 minute. (3) With the starting current available, the highest possible starting torque must be achieved. The higher the starting torque, the safer is starting. With the same current, the starting torque of the variable frequency drives presented hereafter is 20 % higher than that of a conventional VFD intended for industrial use. A good Control Factor results in a good control of suction pressure. The suction pressure is stable and the expansion valve can operate well with a high efficiency (i.e. energy saving), resulting in optimum filling of the evaporator. Maximum rack refrigeration power is relatively high. (6) The smallest possible variable frequency drive allowing safe refrigeration compressor operation should be selected for reasons of cost effectiveness. 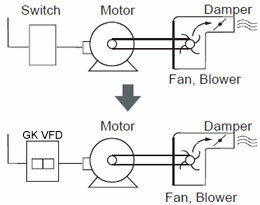 Maximum motor current, as stated in the refrigeration compressor manufacturer's documentation. Based on the above data given, the variable frequency drive starting current required can be calculated. VFD selection on the basis of this method will operate reliably and without any risk for the refrigeration compressor. However, a disadvantage of this method is that in many cases the VFD chosen is too large and therefore too expensive. (8) Consideration of refrigerant characteristics. Starting with R134a for example requires less starting torque than starting with R404A. (9) Consideration of refrigeration compressor make and type. 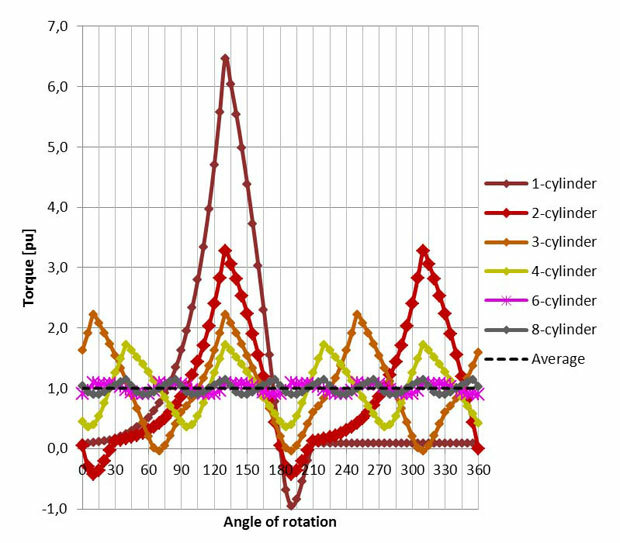 With reciprocating compressors the number of cylinders is particularly important (see following figure). The starting torque of a 2-cylinder compressor e.g. is twice as high as the average torque. (10) Consideration of rack-assisted starting. With an intelligent control system, fixed-speed compressors are started first. As soon as suction pressure is close to the setpoint, the VFD-controlled compressors are activated. (11) Calculating the starting current required. (12) Selection of the smallest possible variable frequency drive able to supply the starting current needed. For manual selection, a consideration of all above factors described above would be too complicated. Detailed VFD and refrigeration compressor information stored in a data base accessed by a selection software is necessary. Compressor manufacturer: Bitzer, Bock, Dorin, DWM-Copeland, etc. Compressor selection list including all relevant electrical and refrigeration data. In many cases information on electrical switchgear is included in the variable frequency drive manufacturers technical documentation. However, switches and cables are usually over dimensioned, as variable frequency drive operating data are not suitable for the selection of switches and cables in refrigeration applications. Sometimes too much copper is used. It is more economical to select electrical switchgear on the basis of the refrigeration compressor's electrical operating data. With the exact selection of refrigeration variable frequency drives and electrical controls and equipment is made possible. The equipment suggested is often more economical than that chosen with conventional methods.